In web-development we meet binary data mostly while dealing with files (create, upload, download). Another typical use case is image processing. ArrayBuffer, Uint8Array, DataView, Blob, File, etc. The basic binary object is ArrayBuffer – a reference to a fixed-length contiguos memory area. This allocates a contiguous memory area of 16 bytes and pre-fills it with zeroes. It has a fixed length, we can’t increase or decrease it. It takes exactly that much space in the memory. To access individual bytes, another “view” object is needed, not buffer[index]. ArrayBuffer is a memory area. What’s stored in it? It has no clue. Just a raw sequence of bytes. To manipulate an ArrayBuffer, we need to use a “view” object. A view object does not store anything on it’s own. It’s the “eyeglasses” that give an interpretation of the bytes stored in the ArrayBuffer. Uint8Array – treats each byte in ArrayBuffer as a separate number, with possible values are from 0 to 255 (a byte is 8-bit, so it can hold only that much). Such value is called a “8-bit unsigned integer”. Uint16Array – treats every 2 bytes as an integer, with possible values from 0 to 65535. That’s called a “16-bit unsigned integer”. Uint32Array – treats every 4 bytes as an integer, with possible values from 0 to 4294967295. That’s called a “32-bit unsigned integer”. Float64Array – treats every 8 bytes as a floating point number with possible values from 5.0x10-324 to 1.8x10308. So, the binary data in an ArrayBuffer of 16 bytes can be interpreted as 16 “tiny numbers”, or 8 bigger numbers (2 bytes each), or 4 even bigger (4 bytes each), or 2 floating-point values with high precision (8 bytes each). ArrayBuffer is the core object, the root of everything, the raw binary data. The common term for all these views (Uint8Array, Uint32Array, etc) is TypedArray. They share the same set of methods and properities. They are much more like regular arrays: have indexes and iterable. A typed array constructor (be it Int8Array or Float64Array, doesn’t matter) behaves differently depending on argument types. If an ArrayBuffer argument is supplied, the view is created over it. We used that syntax already. Optionally we can provide byteOffset to start from (0 by default) and the length (till the end of the buffer by default), then the view will cover only a part of the buffer. If an Array, or any array-like object is given, it creates a typed array of the same length and copies the content. If another TypedArray is supplied, it does the same: creates a typed array of the same length and copies values. Values are converted to the new type in the process. Without arguments, creates an zero-length typed array. We can create a TypedArray directly, without mentioning ArrayBuffer. But a view cannot exist without an underlying ArrayBuffer, so gets created automatically in all these cases except the first one (when provided). arr.buffer – references the ArrayBuffer. arr.byteLength – the length of the ArrayBuffer. Uint8Array, Uint16Array, Uint32Array – for integer numbers of 8, 16 and 32 bits. Uint8ClampedArray – for 8-bit integers, “clamps” them on assignment (see below). Int8Array, Int16Array, Int32Array – for signed integer numbers (can be negative). Float32Array, Float64Array – for signed floating-point numbers of 32 and 64 bits. That’s logical, as Int8Array is not an array of these individual values, but rather a view on ArrayBuffer. What if we attempt to write an out-of-bounds value into a typed array? There will be no error. But extra bits are cut-off. For instance, let’s try to put 256 into Uint8Array. In binary form, 256 is 100000000 (9 bits), but Uint8Array only provides 8 bits per value, that makes the available range from 0 to 255. In other words, the number modulo 28 is saved. Uint8ClampedArray is special in this aspect, its behavior is different. It saves 255 for any number that is greater than 255, and 0 for any negative number. That behavior is useful for image processing. TypedArray has regular Array methods, with notable exceptions. We can iterate, map, slice, find, reduce etc. No splice – we can’t “delete” a value, because typed arrays are views on a buffer, and these are fixed, contiguous areas of memory. All we can do is to assign a zero. arr.set(fromArr, [offset]) copies all elements from fromArr to the arr, starting at position offset (0 by default). arr.subarray([begin, end]) creates a new view of the same type from begin to end (exclusive). That’s similar to slice method (that’s also supported), but doesn’t copy anything – just creates a new view, to operate on the given piece of data. These methods allow us to copy typed arrays, mix them, create new arrays from existing ones, and so on. DataView is a special super-flexible “untyped” view over ArrayBuffer. It allows to access the data on any offset in any format. For typed arrays, the constructor dictates what the format is. The whole array is supposed to be uniform. The i-th number is arr[i]. With DataView we access the data with methods like .getUint8(i) or .gteUint16(i). We choose the format at method call time instead of the construction time. buffer – the underlying ArrayBuffer. Unlike typed arrays, DataView doesn’t create a buffer on its own. We need to have it ready. byteOffset – the starting byte position of the view (by default 0). byteLength – the byte length of the view (by default till the end of buffer). DataView is great when we store mixed-format data in the same buffer. E.g we store a sequence of pairs (16-bit integer, 32-bit float). Then DataView allows to access them easily. ArrayBuffer is the core object, a reference to the fixed-length contiguous memory area. To do almost any operation on ArrayBuffer, we need a view. 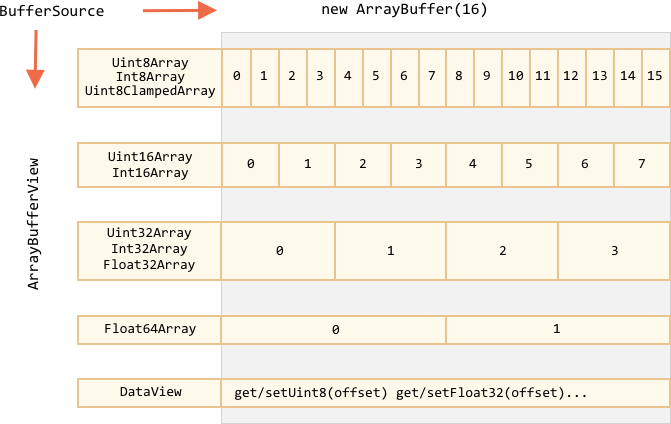 Uint8ClampedArray – for 8-bit integers, “clamps” them on assignment. Or a DataView – the view that uses methods to specify a format, e.g. getUint8(offset). In most cases we create and operate directly on typed arrays, leaving ArrayBuffer under cover, as a “common discriminator”. We can access it as .buffer and make another view if needed. ArrayBufferView is an umbrella term for all these kinds of views. BufferSource is an umbrella term for ArrayBuffer or ArrayBufferView. These are used in descriptions of methods that operate on binary data. BufferSource is one of the most common teerms, as it means “any kind of binary data” – an ArrayBuffer or a view over it. Given an array of Uint8Array, write a function concat(arrays) that returns a concatenation of them into a single array.